A fire at a warehouse in north London sent clouds of smoke billowing over the area on the morning of Thursday, Nov. 23. London Fire Brigade said they were battling the blaze at an industrial estate in Ponders End, northeast London. They said 81 firefighters and 12 fire engines were on the scene after the alarm was raised just after 9 a.m. Smoke could be seen over five miles away in Walthamstow, according to the Enfield Independent. The cause of the fire was not known, but no injuries were reported at this stage, according to a tweet from London Ambulance. 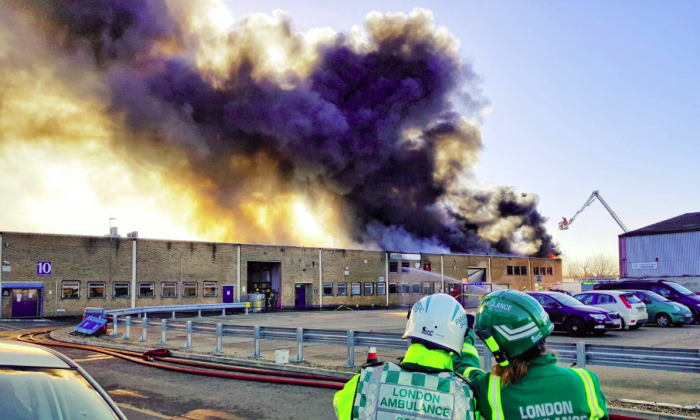 A spokesman for London Fire Brigade said in a statement: “Twelve fire engines and 81 firefighters and officers have been called to a fire at an industrial estate in East Duck Lees Lane in Ponders End. “Half of the ground floor, first floor, and roof of a warehouse are currently alight. “The Brigade was called at 0913. Fire crews from Enfield, Chingford, Edmonton, Woodford, Tottenham, Southgate and other neighbouring fire stations are at the scene.